Fairly frequently I get asked if I miss any food from my pre-vegan life. Mostly the answer is no. I make everything I could possibly want when I'm craving something special and frankly, these days I'm getting back to basics and eating lots of piles of delicious winter vegetables and rice. But, every now and then a girl wants a burger and fries. I found Elevation Burger online when searching for a vegan friendly place to meet up with my friends. With locations all over VA, MD, DE, PA, NY and even down in TX, and CA, I was eager to try these burgers. Elevation serves two veggie burgers, one vegetarian (it has mozzarella in it) and one vegan. They also, interestingly, have a burger called Half the Guilt which is 1 beef patty and one veggie patty. Kinda strange idea. One of the things I appreciate about this place, which has become more common among fast food places, is being able to see your food being made. Behind a sheet of glass scoots the conveyor belt of the grill topped with little hot plates to equally grill your patty as it makes its way to the end of the line. Eating at burger joints that aren't all veg usually mean that your burger sits on the same oil slicked grill as the meaty burgers you have sworn to avoid. 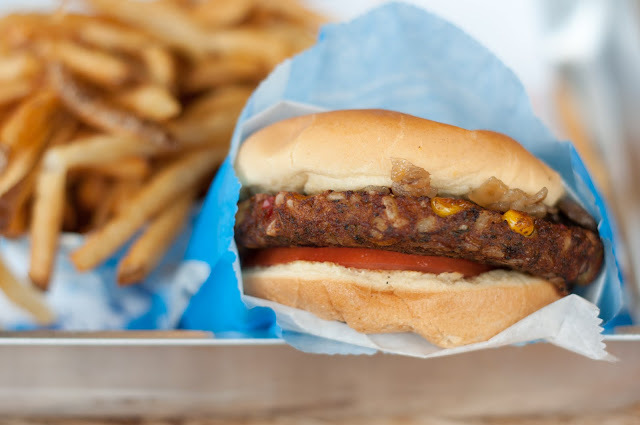 Elevation Burger has two grills running down their line, one for meat burgers and one for veg ones, hurrah! While standing in line we watched them yanking down the crank that pushes the potatoes through the slicer. The fries are shoestring slim and are fried in olive oil until deliciously crispy. Our burgers were brought out to us by one of the employees, wrapped in paper and overflowing with fries. I got a vegan burger with mushrooms, caramelized onions, tomato and ketchup. My friend got the vegetarian burger with balsamic mustard. My vegan burger actually looked more like the meat burgers with its dark brown color but it clearly had corn, broccoli and red peppers stuffed in with the obligatory burger fillers. The vegetarian burger was an off orange color and seemed to have more rice present than anything else discernible. While I'm usually pretty happy with my vegan burgers, I used to always order cheeseburgers. I'll say it again, at risk of sounding like a broken record, but is it so hard to offer a vegan cheese? It's not a huge deal really, but it would just be a great perk. Overall, decent, filling and really inexpensive. Burgers are less than 4 bucks and fries are around 3. Most amazing vegan burger I've ever had? No, but at 4 bucks who would expect it to be. At the very least it's nice to know it's there. They also offer to wrap your burger in greens rather than a bun which I thought was cool. Don't bring your vegan date here of course, but for a quick bite, especially in the company of meat eaters, this would be a great place to meet up or stop on a road trip.